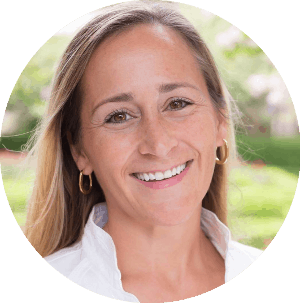 I’ve been married to a Western-New-Yorker for 14 years and have visited Western New York many many times. Unlike New York City, this part of the state has farms, orchards, lakes and a slightly slower pace of life. For a long time I thought a trip to upstate was a trip to the country, with no city to explore and nothing to do. And much of it is “the country”… but once I started actually looking around, I found a place that was perfect for a family vacation. Relaxing pace but lots to learn, and a lot that is different than our hometown of Houston. A trip to western New York is a vacation with slamming screen doors, kids breathing in fresh air, families watching water tumble over a wide waterfalls, figuring out what created the falls and learning how boats could possibly move up and down this Niagara Escarpment. Room to run, reasonable prices, relaxing pace and a lot to learn… Kids and parents can love this trip. Just looking at Niagara Falls is like seeing a nice postcard… but if you spend the time to experience the Falls, it becomes amazing. Not only is the waterfall beautiful, it is very useful for hydroelectric energy and just seeing it makes geology fascinating. Niagara Falls is not the tallest waterfall in the world, but it is the fastest moving. 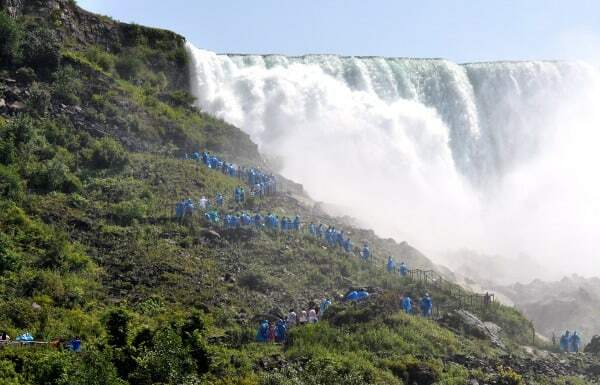 Nearly 6 million cubic feet of water go over the Falls every minute during peak tourist hours. 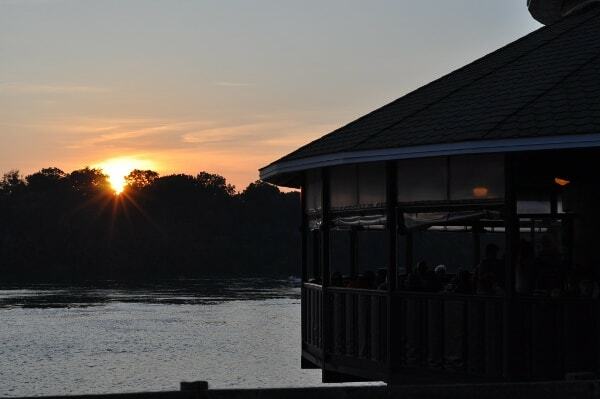 It is located on the Niagara River, draining Lake Erie into Lake Ontario. The water plunges over the Niagara Escarpment, which is a long cliff that runs from New York to Illinios. You can learn all about how this escarpment was formed at the Discovery Center. And better yet, you can experience Niagara Falls on the Maid of the Mist or Cave of the Winds. These are the tours, open May to November, that get you wet. 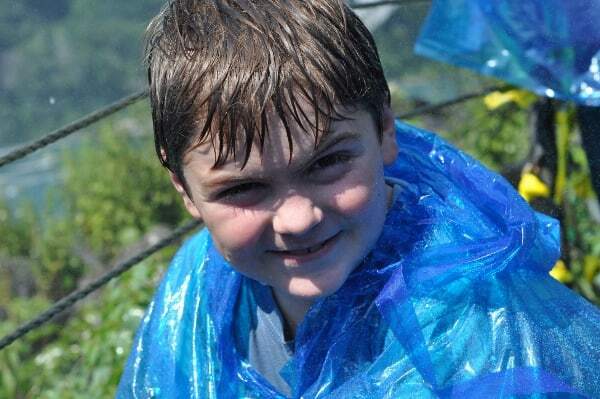 We did the Maid of the Mist on the last trip… you buy tickets (kids 5 and under are free), head to the observation deck, take the elevator (way) down, grab a poncho and get on the boat. 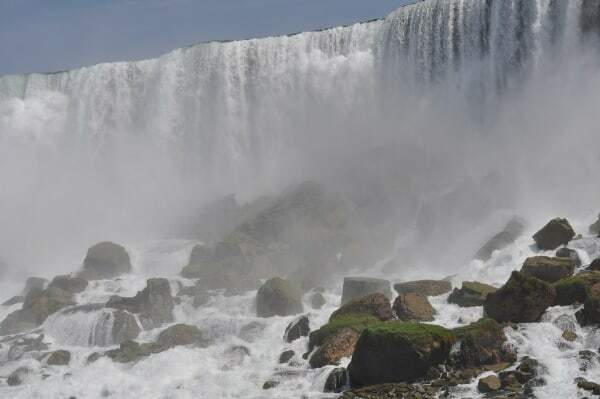 Take a trip next to the American Falls and the big Horseshoe Falls and see just how powerful the water is. When you return, get off the boat and take a very wet walk up to the Crows Nest next to the American Falls. We did not do the Cave of the Winds Tour, but I wish we had. This very wet climb takes you under the American Falls where you will be surrounded by the Falls. 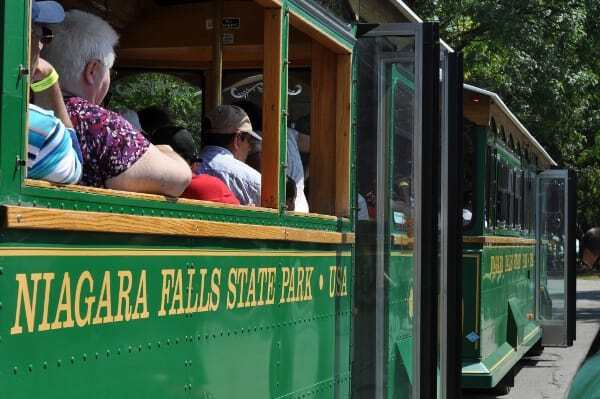 For a dryer tour of Niagara Falls, you can take the Niagara Scenic Trolley to see the park with a tour guide. It’s less dramatic than being drenched by the Falls, but my 3 year old (train and trolley lover) claimed this was the best part. All in all, I can tell you that “doing something” is way better than just going to take a picture. For many many years we just parked and admired. It was when we bought the tickets or packed a picnic that we had the most fun. Since we were determined to “do something”, our next stop was learn about geology and history by visiting Lewiston. Just 10 minutes from Niagara Falls is the beautiful town of Lewiston. River front property with parks, restaurants and quaint little shops. Over 10,000 years ago, this was the site of Niagara Falls. It’s moved back nearly 7 miles and left this little town for us to explore. 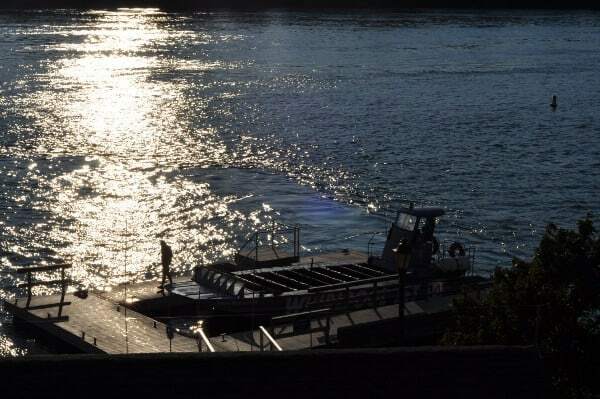 If you take a boat ride, like the Whirlpool Jetboat Tour, you can get upclose to the the American and Canadian hydroelectric stations, cross the Devil’s Hole rapids, see the edge of the whirlpool and, on the tour we took, get absolutely soaked with water from the Niagara River. My older kids were tall enough for this ride (44″) and after our first run through the rapids, they told me it was “the most awesome thing they had ever done”. On this boat ride, you can see you are just a short swim or boat ride from Canada, and it makes sense that this is the historic spot for the Underground Railroad. 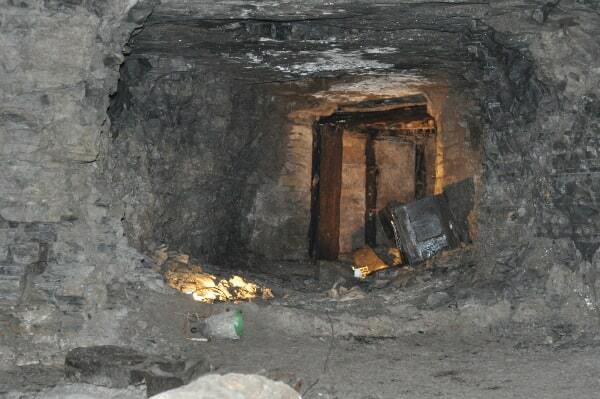 In the early to mid 1800s, Lewiston had a secret network of trails and homes that helped slaves from the Southern United States escape to Canada. The book, Freedom Crossing takes place in Lewiston. You can find the Freedom Crossing Monument on the bank of the river, right next to The Silo Restaurant. After learning about the Underground Railroad, taking a boat tour, getting soaked, changing clothes and eating dinner, we were ready for another lesson about Western New York. How is it that ships move across the state, from Buffalo to Albany, with a giant escarpment in the way? About 45 minutes from Lewiston is the town of Lockport, on the Erie Canal. Connected to the Niagara River (the same river tumbling over the falls), is a man made canal called the Erie Canal. This was originally built about 200 years ago, to ship goods from Albany, on the Hudson River, to Buffalo, at Lake Erie. It connected the Atlantic Ocean to the Great Lakes. The trick is, this canal has to move boats down, and up, 565 feet of elevation differences. To do this the canal contains 36 locks. 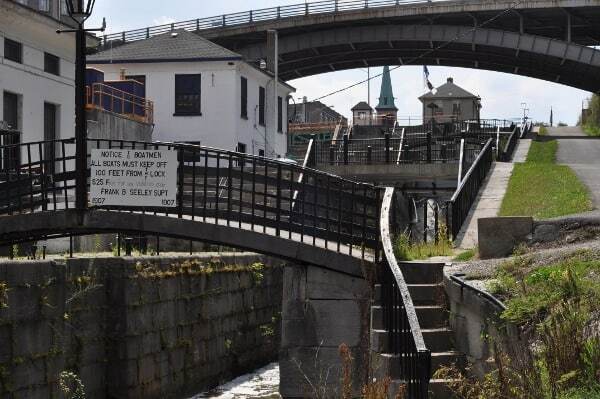 Lockport, New York has the locks that move boats up and down the Niagara Escarpment. And you can see them up close. Visitors are allowed to walk along the canal and get close to the locks. When vessels come through, you can see the “boat elevators” at work. To learn about the canal and the locks, go to the Discovery Center, or if want to go through the locks yourself, you can take a cruise. What we chose to do was the Underground Cave and Boat Tour. This tour took us down to the canal and locks and then into the abandoned water tunnel from old industrial revolution era factories. We walked through a dark and chilly man made tunnel that was carved out of solid rock. 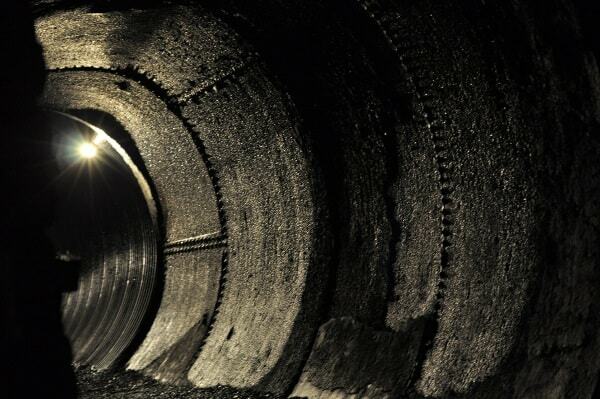 This was the water tunnel under 3 factories. Water from the canal ran through the tunnels, powered a water mill that ran the factories with water mechanical energy. We also visited the Discovery Center were we learned more about the canals and picked up some small treasures. The cool thing about this was the prices. A bag of candy you would expect to be $4 at a tourist stop was only 96¢. In fact, most of the prices in Lockport and Western New York were very reasonable. Once we learned about the Erie Canal, Niagara River and Escarpment, we moved over to explore the Great Lakes. One of the these lakes, with water coming from the Niagara River, is Lake Ontario. Along this lake, you will find farms, orchards, parks and a relaxing pace. Lake Ontario is lined with small towns, farmer’s stands selling produce, ice cream shops, wineries and a “country” experience we’d pay big money for in Houston. Just think of all the farms that open up in October and we pay for the country fun. One small town along the water is Olcott. Here you will find a big lake front park, shops on the water and an old fashioned carnival with 25¢ rides. 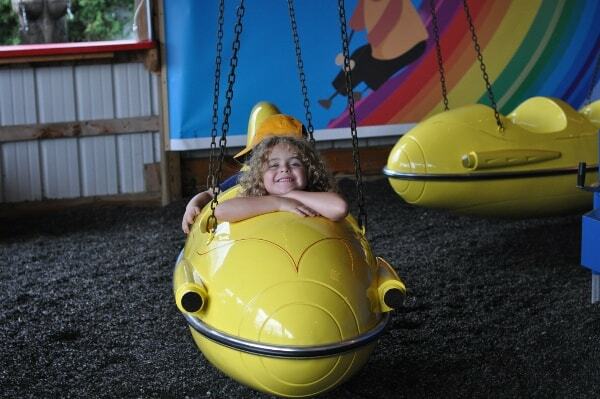 Kids need to be under 52″ for most rides, including small ferris wheel, cars, planes and carousel. Open Memorial Day to Labor Day, this is a very fun place for little kids! Right across the street are shops, restaurants and ice cream parlors on the water. If you drive along Rt. 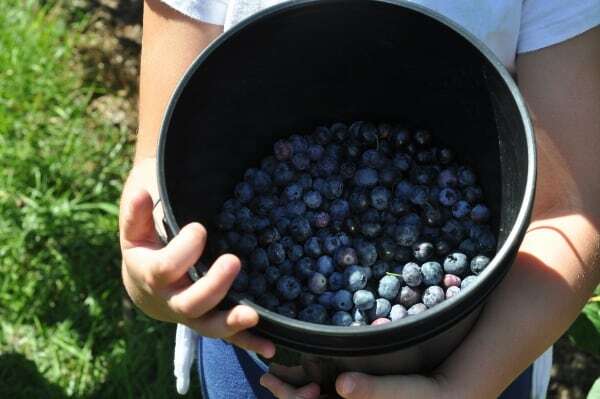 18 towards Somerset, you will find ice cream parlors, wineries, fruit stands, orchards and blueberry fields. Further down Rt. 18, you will find Golden Hill State Park. Here you can go biking, hiking, fishing, boating, camping or even sleep in a lighthouse! 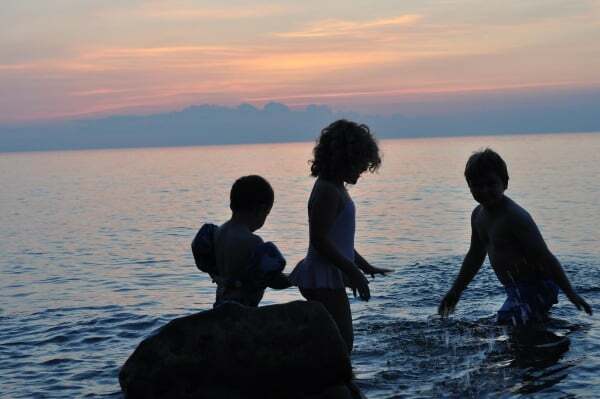 It was along Lake Ontario that the kids ran wild, enjoyed the cooler summer weather, and swam in the chilly water. (For information on Lake Ontario Beach access, go HERE.) Now that we are back home, it’s obvious they miss the slamming screen door and being able to run in and out all day long. 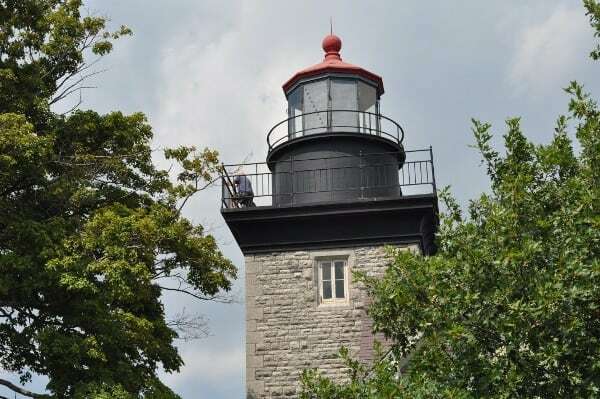 Find even more to do in Western New York from our latest trip, HERE! For this trip, we flew on Southwest Airlines, which I’ve decided I really like for family travel, and can tell you all about it if you ask. Also, we stayed on the New York side of the border. If you plan to cross over to Canada, you need a passport. If you are looking for a fun, educational, reasonable, laid pack vacation, consider Western New York! Give each spot a day to explore, and enjoy! I loved this post! I am from Lewiston, NY, originally. It’s such a great place to visit in summertime with kids. Mine love visiting the beach at Beaver Island— the water is shallow and there are lifeguards, so very low stress with littles. Hibbard’s in Lewiston– amazing custard. 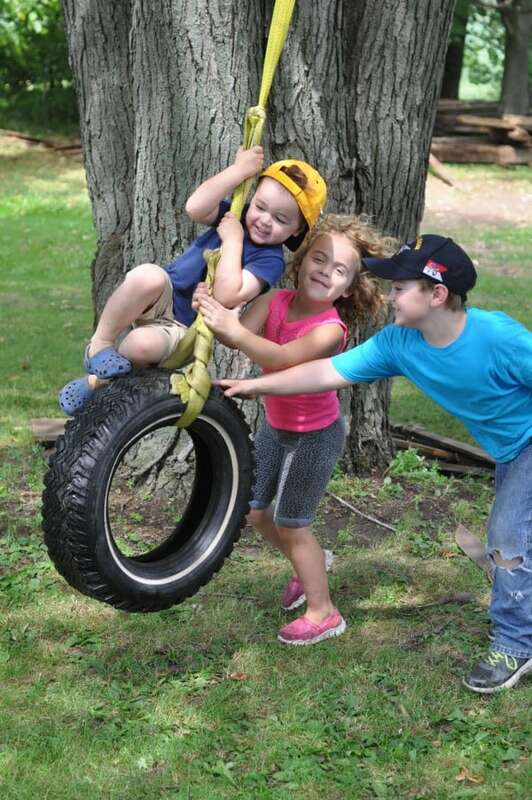 Great playgrounds all over the place in Lewiston and Youngstown. And Artpark! And my mom tells me that Tom Tower’s farm often has kittens…So many treats for kids who grow up in an urban environment that I basically took for granted as a kid. And very inexpensive!